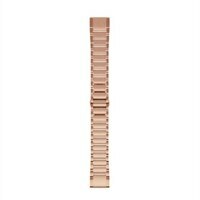 Garmin QuickFit - Watch Strap - Small/Medium 20 Rose Gold Stainless Steel- for fenix 5SJust swap, click and go with interchangeable 20 mm wide bands for your compatible watch. It's easy to switch, and always secure. No tools required.